If you want your skin to look smoother, younger and most importantly, vibrant, a chemical peel can make a significant difference. A facial peel is a specialized medical lotion which when applied to the surface of the skin intensively exfoliates by removing the top dead layer to unveil healthier, fresher skin. This will leave you with a more youthful, healthier appearance and allow your products to truly penetrate the living skin layers. We choose to use AesthetiCare Exfoliating Peels for Skin Peels in Worcester, which use a highly advanced combination of glycolic acid and taurine. Glycolic acid is one of the most effective, clinically proven Alpha Hydroxy Acid (AHA) peels available. It increases exfoliation to produce outstanding results such as rejuvenating your skin and leaving skin softer, with a more youthful appearance. Exfoliation The bonds between older skin cells in the epidermis are broken down, allowing them to fall away. Stimulation – The peel stimulates the entire epidermis causing the creation of new, fresh skin cells and stabilising the structure and function of the skin. Firming – The peel increases the density of collagen and elastin in your skin’s dermis (the fibres that make skin appear firmer) helping to improve the elasticity of your skin. 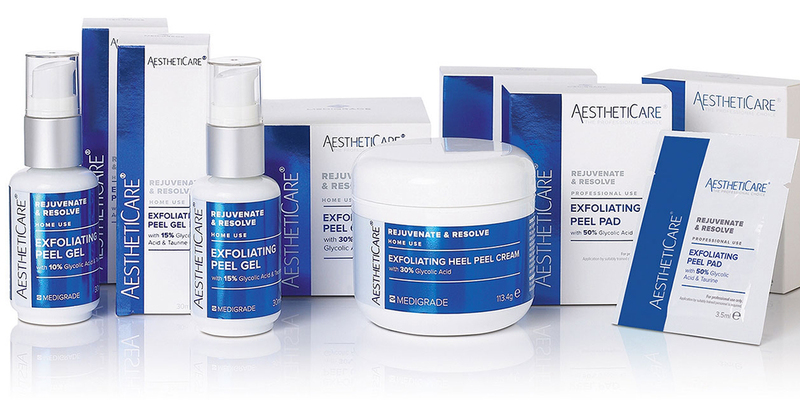 AesthetiCare Exfoliating Peels use a highly advanced combination of glycolic acid and taurine. The high levels of glycolic acid act as the peel agent while the taurine is there to soothe your skin and counter-act some of the negative effects commonly associated with skin peels. Taurine is an amino acid that helps reduce redness and irritation, without impacting on the positive work that the glycolic acid is doing. As long as the skin is maintained with good quality skin care products the improved results will last. We recommend 3-4 one off Aestheticare® professional exfoliating peels per year to sustain desired results for regular maintenance and rejuvenation. You may wear make up the day following treatment. To get the best results I will consult with you on what the most appropriate course of treatment should be depending on the condition of your skin. Before the first in-clinic peel you will be given a home use exfoliating peel gel to use, which is a lower concentration. You should then continue to use this gel throughout the course of treatment to enhance overall results. Each in-clinic peel will take approximately 20 minutes. Following the treatment your skin may be a little red, but this should soon subside. In the days following your treatment your skin will feel dryer and begin to exfoliate. It’s very important that you routinely wear high-level UV protection during the course of your peels and for several weeks after, in fact preferably as a permanent part of your skincare routine, as your skin will be more sensitive than usual. We recommend one of our products from the Heliocare Range as they provide broad-spectrum SPF50 protection as a minimum, and contain powerful anti-oxidants. A course of at least 3 is recommended.